Udzungwa Forest Lodge’s main attraction is Udzungwa Mountains National Park, which is well known for excellent hiking, trekking, mountain climbing and forest walks. With no road access and the only way in being on foot along one of the many trails, the mountains keep their secrets from all but the most adventurous. Once you’ve gained a little altitude, the forest canopy shMoreields you from the heat of the sun and you can enjoy the forest along with the monkeys, elephants, birds, duikers and elephant shrews. There are several trails ranging from short 20min strolls, to 5 day expeditions. The most popular hike is up to Sanje Waterfalls, looking for monkeys, swimming in plunge pools, and enjoying the spectacular view. This is the prime attraction for this area and if you are a keen walker then taking at least one of these hiking opportunities is strongly recommended. Bear in mind, however, that it is very hot, particularly at midday, and this can have a considerable effect on even the fittest of walkers. We offer pack lunches, so make a day of it! Hondo Hondo has everything needed for overnight hiking in the forest.. We offer a package deal which includes tents, mattresses and bedding, porters, a cook and cooking equipment, food and if required, transport to and from the start of the trails – in short, everything you need for a successful trek. We even provide tarpaulin shelter for hikers using our services so you’re not confined to your tent in case of rain. Please click on the button below to see the pdf with all the information for these hikes. Usually people go up and down the short route – its the most straightforward and easiest route to the top. It is still quite a steep climb though, especially in the heat, so be prepared and take plenty of water with you. Put plenty of salt on your breakfast. The trail starts at the (no so) Grand Sanje Hotel and leas past a few houses and smallholdings to the park border and start of the forest. The well trodden and well maintained trail zigzags its way up a ridge until half way up you reach a picnic bench and view point with spectacular views of the falls. A short dip follows to the junction of the path to the base of the falls (see below) and then the path then ascends slightly steeper to the top. At the top, you can follow a short path to the rocks on top of the falls, and have lunch, or maybe first continue up the path to enjoy a dip in the upper falls while you’re still hot and sweaty. 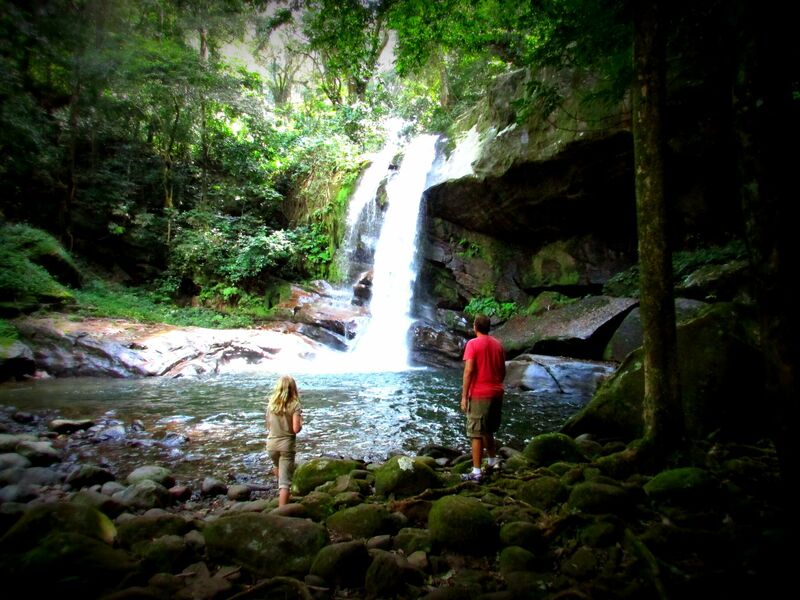 Its only a short walk to the upper falls, the 2nd being the best for swimming. Beware in April/May if there has been a lot of rain – it wall be obvious if its not safe to swim. An alternative and less used path either up or down is from the Sanje Ranger Post. When added to the usual route this forms a circuit. Don’t forget to let your transport know where you will be coming out if you plan to take this route down! (Although its not far to walk back to the start of the Sanje Trail). From the top, cross the river and ascend up to the camp-site following the trail round to the right and then descending with a few ups and downs to the ranger post. This path is also good for Mangeby. Njokamoni is a trail similar in length and altitude to Sanje – around 6.5km and ascending to around 700m. The trail begins at the park headquarters, and you can either set off from the bottom corner of the car park, or join the Njokamoni trail after visiting Prince Bernhards falls. Njokamoni is less used, so its common to see several troupes of monkeys here, and possibly the troupe of habituated Mangebys. Its a good climb with a few view points on the way, and Njokamoni waterfalls is an impressive 40m single drop into a shallow pool, ideal for sitting and splashing around. The path crosses the river and descends to the road. There is a path off to the right that leads directly down to Hondo Hondo popping out of the forest to join our nature trail around the site. Sonjo is a short trail, taking on two waterfalls, both a cascade of water. Its a good option for less keen hikers as the path is not steep, and the trail is short, taking only 35 minute to reach the 3nd falls, but still passing through pristine rainforest. This trail is also a popular 2nd hike for those who have done Sanje the day before, and can be done on the way out of the park. It’s optional to “go and return” via the same path, or cross the water at the 2nd falls, and make a steep 30m up for a couple of hundred meters to the ridge and decend via a different path. Both paths meet the road withing 20m of each other. The Sonjo trail is also the starting path for those ascending Mwanihana. The Hidden Valleys trail (campsite 3 trail) is the longest one day hike. We rec0mmend you start at the Hondo Hondo end of the trail as there is more tree cover to provide shade from the sun during the ascent. The trail takes about 6-7h, and ascends to an altitude of 1300m where its nice and cool with tall moss covered trees. The trail follows the end of Njokamoni trail for a short way, then branches off up the ridge and climbs to just over 1000m where it meets the Njokamoni river just as it comes over the escarpment. This is the start of the Hidden Valleys as you follow the river upstream through grassy valleys with lots of elephants and buffalo tracks. It’s quite popular to have lunch at the Njokamoni river crossing. Look out for African violets on the side of the path, with their round furry leaves and little purple flowers (if in season). The trail branches up a side valley and ascends to the watershed between Njokamonni and Moyer rivers. You’ll follow the elephant trails down the steep and sometimes slippery path to the Moyer river. There are several river crossing as you walk down the Moyer hidden valley, until you again come to the edge of the escarpment and begin the steep decent down – there is a short detour to Moyer waterfalls if you like. Further down you’ll see the devastation caused by fires a few years ago, and with no tree canopy, there is a lot of ground cover riddled with elephant tracks – it’s easy to loose the correct path! You eventually pass through TANAPA’s Campsite 3 near the road and pop out not far from Udzungwa Mountain View guest house. If you like, you can walk back to Hondo Hondo (about 1km) or have a vehicle pick you up. Prince Bernhard’s falls is so named after Prince Bernhard of the Netherlands who visited Tanzania and opened the Udzungwa Mountains National Park aged 84. He was unable at that age to ascend to Sanje Waterfalls, so he hiked the short distance to these falls instead. Only 500m from the park headquarters, these small falls are an easy stroll while park fees are being paid, and a good add-on to Njokamoni trail. Slightly further up the track by campsite 2 is another, larger falls. If you are not a keen hiker, but want a taste of the forest, this trail is for you. A great initiative of the Udzungwa Mountains National Park staff has been working with a troupe of rare endemic Sanje mangebys, helping them to become habituated to people. Tracking them daily and observing their behaviour, the Park staff usually know where the troupe is and can find them given a day or two notice. It is possible for visitors to arrange to take a hike “off-piste” into the forest just above Hondo Hondo and walk via radio direction straight to the troupe of Mangebys. This gives you the opportunity to observe them from very close quarters, undisturbed. It’s an excellent way to get close to this endemic species/genus without disruption to their natural habits. The Mangebys are very used to humans, and can come very close, allowing for the best photo opportunities and the chance to see this rare primate in great detail. Mwanihana is a one or two night trek, taking you on a 38km round trip deep into the forest, and up to 2140m. The trail passes through a number of habitats, from miombo woodland, through grassy plateaux, sub montane forest, montane forest, bamboo, and finally heather at the top. Its quite common to see elephants on this trail. The path begins at Sonjo village, and passes the two falls on the Sonjo trail. There are a few steepish sections interspersed between a steadily rising path from 300m to the campsite at 900m. On the way, you will pass 2 other campsites, one of which you will stay at during the decent of you choose 2 nights. There are often researchers at the 2nd campsite. Much of the trail is in open grassland flanked on either side by tall forest. The campsite, Njia Panda (branching path) is near a stream for washing and water. The next morning you’ll start the hike early to ascend the 1250m to the peak. The path goes up and down for the first section along a grassy ridge, but once it reaches the forest (1500m), it ascends very steeply through giant trees. Half way, there is a cool and tasty trickling stream for filling water bottles. At around 1900m you suddenly leave the forest, and enter an area of bamboo – this zone has seen extensive depletion in recent years due to climate change and less rainfall on the mountain tops. From here, you can clearly see the three humps that make up the top of Mwanihana. The path circles around the tallest one, and after a fine view point on some flat rocks, tunnels through the heather to the trig point and weather station on the top. After descending to Njia Panda campsite, its popular to hike either to the 2nd or 1st campsite (or if you’re on a 1 night hike, to hike all the way out). For those who have bought 48 of park fees, the following morning is an early start to cover the remaining few km to leave the park, or if you’ve opted for 3 days park fees and stayed a 2nd night at Njia Panda, a more leisurely stroll can be undertaken taking in more of the wildlife and surroundings.